The 4100 is the first school-focused headset to feature a USB plug and also the first to offer single To Go plug compatibility with MAC and Windows-based computers as well as iOS and Android-based smartphones and tablets. With either its USB plug or single 3.5mm stereo To Go™ plug, students use the 4100 to create digital podcasts or recordings of their progress. This activity specifically supports the Common Core's Speaking & Listening standards. The 4100 with a To Go plug is compatible with mobile devices including but not limited to the Apple iPad, the KUNO 3 from Curriculum Loft, the Unobook from CDI, Brainchild's Kineo, the Iconia Tab series from Acer, the ASUS Transformer Pad TF300T, Samsung's Galaxy tablet, Viewsonic's Viewpad, the Microsoft Surface, Google's Nexus 7 and Amazon's Kindle & Kindle Fire. The adjustable noise-cancelling boom microphone is a dependable choice for high-speed delivery of curriculum for ESL/ELL students, in gaming and for AP language classes, literacy functions and for testing to meet the ELA portion of the Common Core State Standards. It's used for distance learning & Skype conversations, computer & cloud-based tutorials requiring vocal responses in classrooms, libraries, computer labs and in mobile learning settings. This state-of-the-art headset is as comfortable a model as you'll find with cushiony earpads and a comfort-sling headband to evenly distribute its weight, making it sought after for when a headset needs to be worn for extended periods of time. Its noise-reducing earcups rest around not in the ears to provide maximum protection against ambient noise so students won't increase the volume to hear the content. Made from rugged ABS plastic, the earcups won't shatter (unlike materials used in consumer electronics items) into potentially dangerous shards and will withstand the rigors of daily use to help children remain focused on learning. The entry point of the cord into the earcup is reinforced and has in-line volume control for individual preferences. The USB version has in-line mute, mic on/off and volume control while the To Go plug version does not. 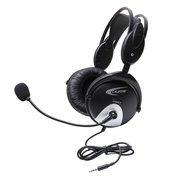 The 4100 is available as a classroom pack of ten 4100USB headsets with a storage case (4100-10) or a classroom pack of ten 4100AVT models with To Go plugs without a storage case (4100AVT-10L). Plug and play - eliminates the need for a sound card Windows/Mac compatible In-line mute/volume control on the 4100-USB model only (the volume for the 4100AVT is controlled from the device) ABS plastic earcups and headband for durability Adjustable comfort sling fits all sizes Flexible boom microphone for language applications Reinforced strain relief connector won't pull out This headset has multiple plug choices to fit a variety of devices. Make sure your selected headset has the right compatible plug to fit the intended audio source.